a new campaign to de-alert and stand down (eliminate) the Minuteman lll missile is happening. Call President Obama today at 202-456-1111 and ask him to de-alert and stand down the minuteman lll. Come to our trial of The Vandenberg 15 in Santa Barbara, CA with events starting on Oct.16, a public forum: “Putting Nuclear Weapons on Trial” in the Santa Barbara library and the trial beginning on Oct. 17, 2012. More information by emailing jajaja1234@aol.com. The US nuclear arsenal includes 450 land-based Minuteman III Intercontinental Ballistic Missiles (ICBMs) armed with thermonuclear warheads. These ICBMs are deployed in hardened silos in North Dakota, Wyoming and Montana. They are easily detected and targeted. The missiles cannot prevent a nuclear attack on the United States – there is no way to preemptively eliminate all of an adversary’s nuclear weapons. A launch would ensure retaliation by a nuclear adversary. These missiles are on high alert every moment of every day. The decision to launch would be made by the President in 13 minutes or less if he believed there was an impending attack. The Washington Post recently called this “13 minutes to doomsday.” Thirteen minutes with the very real possibility that false information, an electronic glitch or bad signal, or an error in human judgment would bring the world as we know it to an end. An immediate step that could be taken would be to de-alert the missiles so that 24 to 72 hours would be needed to launch. This would increase our security by eliminating the possibility of accidental or unauthorized launch. A more significant step would be to make the decision to retire and eliminate all land-based ICBMs. They are expensive to maintain and do not address 21st century threats. In a major unilateral nuclear attack without retaliation from the other side, the smoke from burning cities would block sunlight sufficiently to destabilize the environment, reduce warming sunlight to the lowest levels in at least 1000 years, shorten growing seasons and decrease sustainable agriculture, lower food production and create nuclear famine worldwide. Simply put, even a one-sided attack without retaliation would be tantamount to suicide. Nuclear weapons have no application without inflicting harm on oneself. It is time we fully understand that any nuclear war that attacked another side’s cities would have consequences for the well-being of everyone on the planet, regardless of wealth, political affiliation, race, etc. The United States and the world would be far more secure by eliminating nuclear weapons, beginning with the Minuteman lll Intercontinental Ballistic missiles. Please call or send a message to the White House today (call the White House at 202-456-1111) and ask President Obama to de-alert and decommission the US land-based missile force. It is unneeded, provocative, and could be launched to a false warning. US citizens and people throughout the world will be safer and more secure without them. “Crossing the Line: A Call to Revolutionary Love”, the 14th annual Kateri Peace Conference will be held on Friday, August 17 and Saturday August 18, 2012 at the Kateri Tekakwitha Shrine in Fonda, NY. Below is an article by, “The Evangelist”. Complete conference information may be found at www.kateripeaceconference.org. Information for Bishop Gumbleton’s Day of Reflection, “Active Love and Nonviolence: The Only Moral Response to War”, may be found there also. Please come. Please pass this along too. Learn more at www.kateripeaceconference.org, call 869-6674 or email aumandmaureen@gmail.com and jajaja1234@aol.com. Deadline for the retreat day is Aug. 10; no one is turned away for lack of funds. Peace activists of all faiths will meet at the National Shrine of Blessed Kateri Tekakwitha in Fonda for the annual Kateri Peace Conference Aug. 17-18. The theme for the weekend is “Crossing the Line: A Call to Revolutionary Love” – which means overcoming fear and focusing on love, coordinators said. Mr. Amidon served in the U.S. Marines in the late 1960s before turning to civil resistance and peace activism. He began the peace conference in 1998 with an interfaith pilgrimage from Fonda to Albany to advocate the closing of the U.S. Army’s School of the Americas in Fort Benning, Ga. The SOA, now called the Western Hemisphere Institute for Security Cooperation, has been accused of training soldiers who killed innocent civilians in Latin America. The peace conference’s focus shifted with the start of the military conflicts in Iraq and Afghanistan; today, it protests issues like military spending, the use of drones and hydraulic fracturing. Attendance ranges from seven to 240 participants. This year’s conference will feature a Catholic retreat on non-violence with Bishop Thomas Gumbleton, a retired auxiliary bishop of the Archdiocese of Detroit. Walt Chura, an essayist, teacher and lay Franciscan from the Albany Diocese, will tell the story of St. Francis of Assisi’s peacemaking efforts with an Egyptian sultan during the Fifth Crusade. Other highlights include a dramatic reading of Dr. Martin Luther King Jr.’s “Declaration of Independence from the war in Vietnam” speech, reflections on activism and a panel of well-known activists like Kathy Kelly, a three-time nominee for the Nobel Peace Prize. She coordinates Voices for Creative Nonviolence, a campaign to end U.S. military and economic warfare. Blessed Kateri Tekakwitha, the 17-century Mohawk maiden who will be canonized this fall, is an inspiration for the peace cause, coordinators said. Conference organizers envision what Mr. Amidon termed “a society less dependent on violence and guns, and more life-affirming. Three members of Veterans For Peace — Russell Brown, John Amidon, and Elliott Adams — were among 33 peaceful protesters arrested on Sunday outside Hancock Air Field in New York State. Almost all of the 33 were arrested preemptively, as they walked single-file and silently along a road, prior to reaching the military base, at which they intended to approach the gate and deliver a written statement. I received an email from the Nye County Sheriff’s Department expressing concern over a recently posted article, “A Grand Old Flag and the Sheriff of Nye County.” The concern, as I understand it, is that some readers might not fully understand that the title and use of the phrase, Sheriff of Nye County, is a metaphor and that when referring to the Sheriff, it meant the law enforcement and security personnel at the Nevada Test Site on Easter Sunday. The story also employed a personalized style of writing, a literary device, to heighten interest in it. 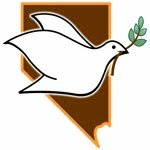 Since this article was written in the spirit of good will and understanding, to discuss important issues, and that perhaps some readers might not fully understand this, I wish to clearly state this article was not meant to suggest that Sheriff A. DeMeo, was at the Nevada Test Site on Easter Sunday, April 4, 2010. Sheriff DeMeo was not at the test site and did not confiscate the American Flag. Again, the phrase Sheriff of Nye County was used as a metaphor representing the law enforcement and security personnel present. I respect the Sheriff and his department and the good work they do. I fully understand they perform an important and difficult job. This too was clear in the original article. To be sure this is understood, I offer my apology to Sheriff DeMeo for any misunderstanding this article may have created. Since the article was written to discuss a number of very important issue which I still hold very dear and as a Veteran of the USMC and one who still honors the U.S. Constitution and serves his country, I have changed the title to avoid any future possible misunderstanding and have substituted law enforcement personnel for sheriff. The article is immediately below for those who have not yet had an opportunity to read it. Thank you! Few Americans know that the original lyric in George M. Cohan’s “You’re a Grand Old Flag” was “rag”. Mr. Cohan explained he had a chance encounter with a Civil War veteran who carried “a carefully folded” yet tattered old flag. Mr. Cohan took notice and the veteran responded saying, “She’s a grand old rag.” The public however demanded flag and after all, it is show business. Yet what does the flag truly represent? And why did law enforcement personnel confiscate the American flag on Easter Sunday from an middle aged woman at the Nevada Test Site (NTS) then later attempt to return it? In an earlier and simpler time Mr. Cohan’s lyrics might have summed it up pretty well, “You’re a grand old flag, you’re a high flying flag and forever in peace may you wave. You’re the emblem of the land I love. The home of the free and the brave.” Yet somewhere from then to now, the Republic became an Empire and the values which our flag once seemed to clearly represent have for many become a distant memory. We are no longer the brave for we fear each other and our own government. Our freedoms are eroding and our economy is approaching collapse with a staggering 12.5 trillion dollar national debt thanks to ill advised permanent war in the Middle East and because our politicians lack backbone and consistently borrow and spend. When serving in the USMC, I took an oath to support and defend the Constitution of the United States, along with the Declaration of Independence. I know torture is wrong and that habeas corpus is essential for the rule of law. There is no such thing as secret evidence in the country I know and love, so when the FBI uses entrapment based on secret evidence, I am extremely disturbed. When I carry the flag it is to signify the profound respect for and the dignity inherent in the Bill of Rights, freedom of speech, habeas corpus and the rule of law. I carry the flag as a symbol of protest with the hope those Americans who would limit our freedom, who are comfortable with secret detention camps and extraordinary rendition and secret evidence will somehow remember what we once stood for a nation where all were equal in the eyes of the law. I carry the flag like our forefathers did, in resistance to any would-be King George. Lately it seems there is a would-be King George under every bush. Our nation is grinding and slouching and borrowing its way towards a totalitarian state with militarism, apathy, and greed as its guiding constellations. For many of us it is clear that nuclear weapons pose one of the greatest if not the greatest threat to all of humanity. As President Obama works to limit the proliferation of nuclear weapons, we might well asked who spawned this epidemic of WMD’s and then take a long hard look it the mirror. Nuclear weapons in their inception and development are a crime against humanity. They are designed to kill all living things without discrimination. This is why, year after year, we return to the Nevada Test Site to insist upon a responsible government and the abolition of nuclear weapons. The choices offered by our government are utterly absurd, mutually assured destruction (MAD) and unacceptable damage (UD). For the sake of our world we must honor and implement the Nuclear Non Proliferation Treaty and decommission all nuclear weapons. We must also act quickly to implement nuclear waste cleanup at sites such as Hanford and our nuclear power plants. Until there is long term containment for nuclear waste, it is time to stop using this dangerous science. When my friend Catherine carried the flag across the line at the NTS, she carried it proudly knowing all life is sacred and all nuclear weapons are an offense to God and a threat to our nation. Catherine carried the American flag as a flag of protest, like the flag our forefathers created, a flag of profound revolutionary values, which respected the common man and his right to freedom of thought and expression, a government responsive to the will of the people and taxation with true representation. This government would not only tolerate but respect and encourage loyal dissent as a vital and necessary voice for the well being of democracy. When law enforcement personnel confiscated the American Flag, it is likely they understood what was being confiscating and that Catherine was a true American patriot representing the best in America, carrying the flag in loyal and peaceful opposition to the excesses and mistakes of our government. It was right of the law enforcement personnel to recognize the true American values by attempting to return the American flag. That in fact they have failed to recognize, the US government is occupying the Shoshone Nation, that they have no jurisdiction on that land and were there illegally arresting Catherine and others, who were there legally, simply indicates the amount of work that is yet to be done to begin the restoration of “liberty and justice for all.” That the NTS is stark testimony to one of humanities greatest failures, the development and testing of nuclear weapons, that it has created untold death and disease in all of the neighboring states, and killed many ‘down winders” and that this site is protected by law rather than dismantled also shows clearly how much work is still to be done. I would like to quote one paragraph here. Nearby and not long ago, compassionate Las Vegas passed a law that criminalized feeding the homeless. The law was overturned. And Arundhati Roy provided us with this provocative and particularly pertinent insight about flags in a time of war. One half of one percent bear the immediate burden of our wars waged by this country and the rest of us go on as if the wars do not exist.